Anybody Used Infortrend Storage For Surveillance? 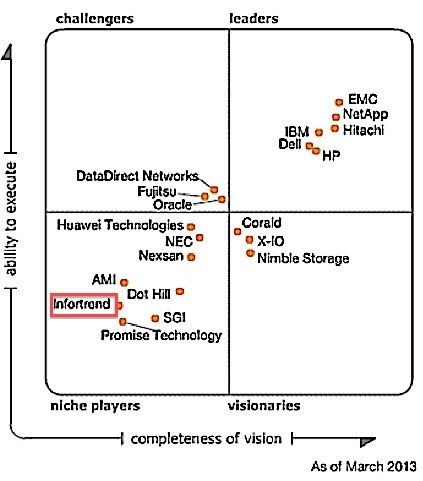 Read about the storage called Infortend and found them in the Gartner Magic Quadrant for Storage Arrays. Has anyone used these in Surveillance Storage for realtime recording? I am curious if this will support 30-64 Megapixel cameras recording 24*7.They claim to have their own Release of Enterprise Hard Drives from Seagate,Hitachi etc with specific Firmware for their raid controller/Storage. Looks appealing but any reference from people who have used this for surveillance would be very helpful. Is there anything special about Infortrend that appeals to you, besides the Gartner listing? I am surprised they are in the magic quadrant because they are a pretty niche company. And this 2013 Gartner recap indicates just that. Also, the company's own surveillance solution description is fairly nondescript. 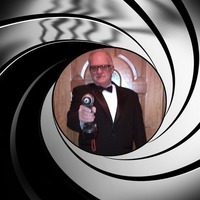 That said, Carl, a frequent commenter and casino end user, has used Infortrend for years in a large surveillance system. Well besides the Gartner listing, the cost per TB very cheap 150-170$ when you purchase them with Enterprise Nearline SAS Hardrives(Infortrend Brand).I dont know how brands like Promise technology or Huawei compares in Cost/Performance.If there is anybody with reference please comment.  I am still confused about the Gartner reference. Are you referring to something else besides the one I cited above? Because in that one, they are considered a niche player with a poor ability to execute (lower left hand side). Also the fact that Pelco used Infortrend OEM as thier product Pelco DX8100HDDIxxxx also looks interesting. That is True, Pelco used them in the past as an OEM. We have about a dozen successful integration with them ranging from the 100TB to 600TB deplyments. They use to sell Direct few years back but recently changed their Busniess model in last few month. Yes, we used Infortrend RAIDs for 7 years until we replaced our system last year. On the one hand, they are relatively cheap and perform fairly well. On the other hand, support was woefully lacking. Anytime we had a problem, we would contact U.S. Tech Support, who would have to in turn contact Taiwan Tech Support. The back and forth would often take forever to get a single question answered, if it ever was. Also, we had trouble obtaining replacement parts after around the 4-year mark. This included power supplies and controllers. And I've heard, they've gotten even worse from a support aspect. By the way, you might take a look at Fujitsu. I was relatively impressed with the demo they brought during our system evaluations. Though we didn't choose the vendor or the system they demonstrated it with, I would seriously consider them.